Paige Bueckers, the sophomore point guard from Hopkins High School who is among the most coveted prep basketball players nationally in the class of 2020, has a Lindsay Whalen jersey and autographed Whalen shoes in her bedroom. Whalen, the Lynx WNBA champion point guard and former Gold Medal Olympics winner, was named University of Minnesota women’s basketball coach last week. “She (Paige) is excited for Lindsay. She has been a big fan growing up,” Hopkins coach Brian Cosgriff told Sports Headliners. At this time of year, per NCAA policy, coaches like Whalen can’t contact high school sophomores. That doesn’t mean, though, Paige won’t be following the 35-year-old Whalen who not only will be in the news as Gophers coach but also while continuing her career this spring and summer for the Lynx as the team attempts to repeat as WNBA champs. “She is interested to see where Lindsay is taking the program,” Cosgriff said. Bueckers frequently attends Gophers games so she is already familiar with the team and Williams Arena. But Cosgriff said don’t mark her down as a future Gopher yet because his all-state player is sorting through college options for now. Those options include an offer from Connecticut’s storied program and legendary coach Geno Auriemma. He has been to Minnesota multiple times to watch Bueckers. “He’s a huge fan (of Bueckers),” Cosgriff said. Count Notre Dame, Stanford and much of the Big Ten as schools wanting Bueckers who has been on the Hopkins varsity since eighth grade and starting at point guard for the last two seasons. The 5-11, 150-pound Bueckers averaged 23.5 points per game for the Royals last season who finished second in the Class 4A state tournament despite her 37 points. Last season she made 54 percent of her field goals, 52 percent of her threes and 90 percent of her free throws. Some games she scored more than 20 points by halftime. 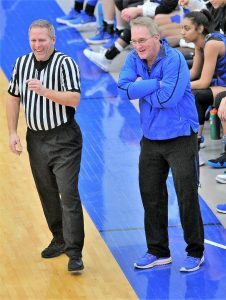 But Cosgriff said his wunderkind (she had a six to one assist to turnovers ratio) would “rather pass than shoot,” and when sitting on the bench is the Royals’ biggest cheerleader for teammates. Fundamentally advanced for her age, and so versatile Cosgriff will even play her at center, Bueckers prompts raves when people talk about her. That starts with her coach who has been at Hopkins for almost 20 seasons, winning titles and building the Royals into a power. “She is the best I’ve had, and I’ve had some good ones,” Cosgriff said. The roll call of great players in state history includes Nia Coffey who was terrific at Hopkins and now plays in the WNBA. Mention any legendary names to former Gopher guard and assistant coach Al Nuness and that won’t deter him from offering the highest praise to Bueckers. 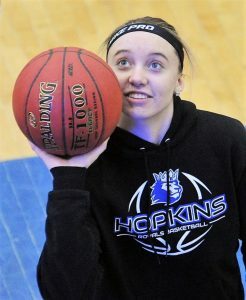 “I think she will be the best women’s basketball player ever to come out of the state of Minnesota,” said Nuness who works at Hopkins as a paraprofessional. Nuness has watched Bueckers practice and refers to her as “phenomenal”—yet he sees a player who will continue to improve. “I don’t think she is even close to reaching her potential,” he said. Bueckers will have a busy offseason from high school basketball including the Boo Williams Girls Nike Invitational in Virginia this weekend where she will play for the North Tartan AAU team. There is already speculation about how long Whalen continues her dual role of playing for the Lynx and coaching the Gophers. Will she retire from playing after this summer? There are a lot of priorities to balance between the two jobs. The Gophers Athletic Department announced this week a goodwill tour stopping in nine communities in the state during May to visit with fans. The list of coaches from the department participating in the tour totals 14, but doesn’t include Whalen who will have preseason and regular season games with the Lynx during the month. DeLaSalle class of 2019 point guard Tyrell Terry tweeted this week he received a scholarship offer from the Gophers. Iowa State and Stanford are among schools showing interest, too. Birthday department: Twins first baseman Joe Mauer is 35 today and Timberwolves owner Glen Taylor turns 77 tomorrow. The Wild, down 3-1 to the Jets, will see a raucous crowd tomorrow night in Winnipeg’s Bell MTS Place. “It will be as loud as any building you’ve heard,” Fox Sports North commentator Kevin Gorg told Sports Headliners. Gorg said defenseman Nick Seeler, called up from Iowa this winter, has been a surprise and played “phenomenal.” The 24-year-old has brought aggressive play to a defensemen roster thinned by injuries. Gotta be a big fan to buy airfare at the last minute from Minneapolis to Winnipeg for Friday night’s game. Expedia quoted a cost of $976 yesterday for round trip leaving today and returning Saturday. With his affection for NFL Draft maneuvers, it will be fun to see what Vikings general manager Rick Spielman comes up with later this month. As of now the Vikings will watch 29 other selections be made in the first round before their turn in the first day of the NFL Draft on April 26. Athlonsports.com predicted in a mock draft the Vikings will select Notre Dame offensive tackle Mike McGlinchey. Spielman has shown a liking for Fighting Irish players in the past. “McGlinchey may eventually take over at left tackle but he’s a starter right away on the right side and would fit in well to the Vikings’ scheme,” Athlon said. The Vikings have single picks in the first, second, third, fifth and seventh rounds, and three selections in the sixth round. A pro football source told Sports Headliners he expects the Vikings to prioritize offensive linemen and defensive backs in the draft, and probably select a running back. Spielman was all but destined to have a career in football. His father was a high school coach in Ohio and the family lived within a few blocks of the Pro Football Hall of Fame in Canton.